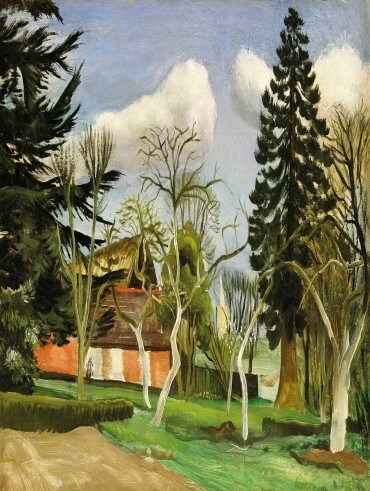 The so-called ‘Great Bardfield Artists’, named after the Essex village where a community of painters and designers lived from the 1930s onwards, has become fertile ground for local auction house Sworders (22% buyer’s premium). The saleroom’s latest £235,000 sale of Modern British and 20th century art on November 13 in Stansted Mountfitchet continued this trend. The auction opened with 64 Bardfield lots, all bar five of which got away to a mostly private pool of buyers. Among the Great Bardfield artists making the biggest strides on the secondary market is the London-born painter John Aldridge (1905-83). Amy Scanlon, head of the picture department at Sworders, said prices for Aldridge had quadrupled in the last five years. This was exemplified in the sale by a vibrant and well-preserved 18 x 2ft (46 x 62cm) oil on canvas titled Home Gardens, Early Days, which was pursued to £3800 against a £2000-3000 guide. Outside the Great Bardfield section, a bronze sculpture by Eduardo Paolozzi (1924-2005) titled Self-Portrait with a Strange Machine sold for the sale-topping price of £22,400, although it failed to clear its £20,000-30,000 guide. The 2ft 9in (85cm) high piece came from the collection of the late artist Michael Rothenstein, and is thought to have been a gift from Paolozzi. Results for Paolozzi’s sculpture can be patchy at auction, perhaps because the artist is not solely regarded as a sculptor and excelled in several different mediums. Sworders’ example was based on another bronze self-portrait The Artist as Hephaestus, a large 8ft 8in (2.64m) high bronze statue commissioned in 1987 by the London and Paris Property Group, which failed to sell when it was offered at Bonhams in 2012. It reputedly sold two years later to art dealer Wentworth Beaumont for £110,500.